Where Should Dollars Come From for Fuel Switching? The triumph of renewable electricity has implications for other sectors traditionally controlled by the fossil fuel industry, and for regulators of those industries. New, commercially available options allow transportation and buildings to tap into this renewable energy revolution. Public overseers of gas and electric utilities now face the question of whether it’s appropriate to redirect scarce conservation dollars to “fuel switching,” providing financial incentives to switch energy customers to rapidly-becoming-renewable electricity. In transportation, electric vehicles have quickly outstripped hybrids as the go-to and affordable technology to reduce driving costs and pollution. 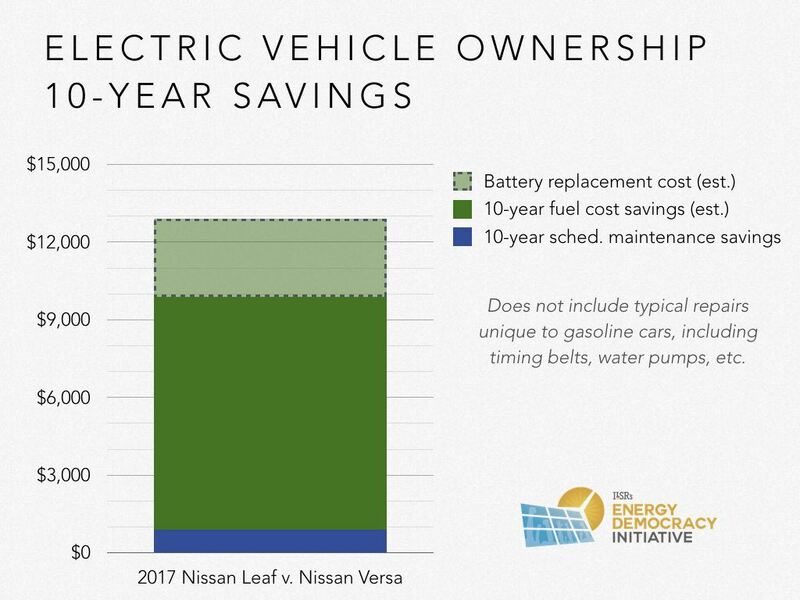 Despite higher upfront costs, today’s electric cars have the range to cover most Americans’ daily driving at one-third the fuel cost of gasoline, providing substantial lifetime savings. Electric vehicles are offering such a compelling financial proposition to drivers that it now threatens oil and gas producers, who recently spent big to kill a Texas wind farm. Electrification’s next victim is fossil-fueled building heating. In rural areas, ground-source or air-source electric heat pumps can drop in today with significant savings for customers whose furnaces or water heaters use delivered fuel like propane or fuel oil. In urban areas, customers connected to cheap gas infrastructure have had much lower energy costs to heat their homes and water, thwarting cleaner alternatives. Newer versions of air-source heat pumps offer more efficient cold-weather operation, the cleaner grid electricity may finally be coming for the gas-powered appliances in homes and businesses. The opportunity for big savings and big cuts in pollution poses a big question to energy system regulators: should utilities be able to use conservation dollars to encourage customers to “fuel switch”; in general, to switch from fossil fuel to electricity. A Bigger Question: Why Not Use Their Own Money? 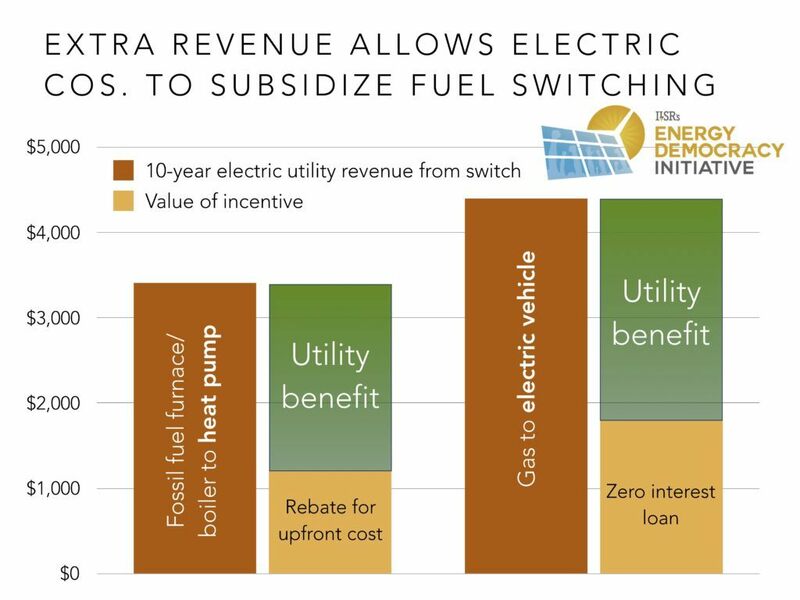 ILSR agrees with all four principles, but asks a related question: if an electric utility stands to gain more sales by encouraging customers to switch fuels, then why does it need to spend conservation dollars to do it? 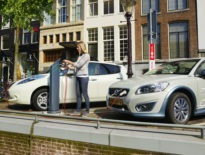 An electric vehicle will use, on average, about 4,000 kilowatt-hours a year, providing an additional $440 in annual revenue to the electric company that provides the power (based on the national average of residential retail electricity prices). Likely to be in use for at least 10 years, each electric vehicle is worth over $4,000 in total additional electric sales revenue. Electric utilities could use a portion of that new revenue to offer rebates on vehicles or charging infrastructure, or to subsidize financing to lower upfront costs. For example, the Chevy Volt and Honda Fit are similarly sized hatchbacks, but the former retails for $36,000 and the latter for just $16,000. The federal tax credit closes the gap to $12,500, so what if an electric utility loaned a customer the difference at no interest? The total subsidy (assuming a 4% interest rate for the loan over 72 months) would be $1,800, less than half the total anticipated revenue from electricity sales. Similarly, a residential air-source heat pump will boost electric provider revenue by $341 annually, if the customer uses an Energy Star model, providing over $3,000 in total additional revenue over 10 years, well over the average $1,200 premium for an air source heat pump compared to a natural gas furnace. These are good minimum standards for using conservation funds, but given that electric utilities already have a financial incentive to switch customers, I’d add a fifth: incentives must target investments with a useful life greater than 10 years or be more cost-effective than traditional conservation investments. In other words, if we’re going to use scarce conservation dollars on fuel switching let’s focus on the big things (furnaces, water heaters, boilers). 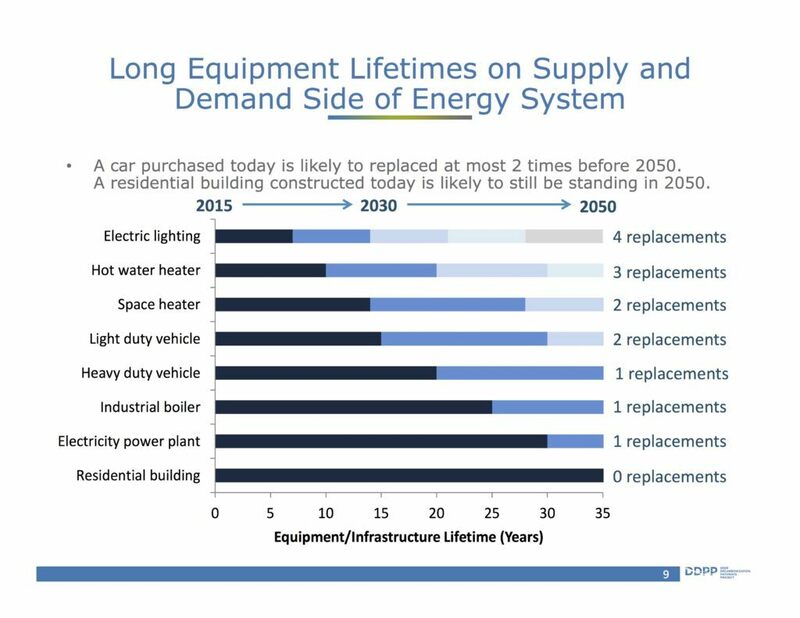 In a post last year, I shared this graphic from the Deep Decarbonization Pathways Project that shows how few chances we have to intervene to decarbonize some major energy uses, such as boilers or vehicles. Fuel switching is a terrific concept as the electricity sector goes renewable, but conservation dollars play an important role in shrinking the denominator, reducing the fraction of total energy that must be converted to clean sources. 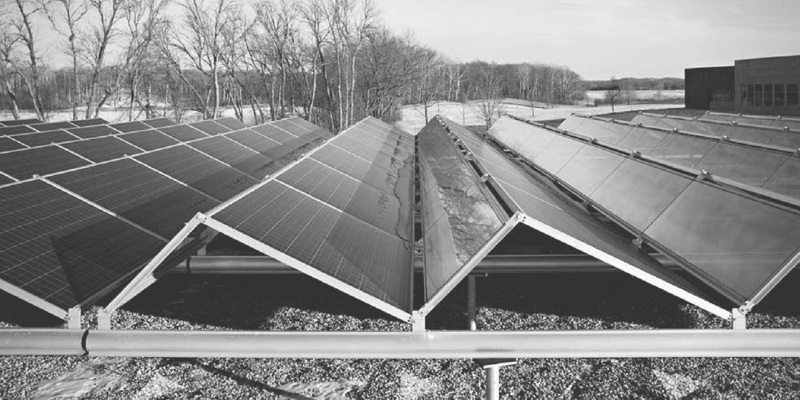 There’s no reason utilities can’t pony up their own money for growing their business, and if utility regulators will allow use of conservation money for fuel switching, it should be reserved for investments with a big, long-term reward.